Doc at Gold Rush Days! 1. Don't excercise, as it leads to fatigue. 2. Hand over the day-to-day work reins to assistant in order to concentrate on product development. 3. Teach assistant Bleb accounting and how to play banjo. 4. Develop a hair restorative that doesn’t explode or eat through the bottle. 5. Develop more games of chance that aren’t. 6. Invent a cure for which there is no disease, and market the hell out of it. 7. Hide money where “Mrs. Doc” won’t find it. 8. Don’t hide paper money in the hay bin that the mule eats out of. 9. Convince printer to pay for labels in exchange for free advertising. 10. Convince mother-in-law that she should visit Tierra del Fuego. 11. Never warm the label glue near the stove when the wife is preparing gravy. 12. Eat fewer beans, at least before a show. copyright ©2008 Laurie J. Anderson, all rights reserved. “This is a business,” I told Santa, “and I can’t afford to give this valuable product away, even to a fellow miracle-worker.” So all Kringle could do last year was leave notes under a bunch of trees referring people to me. The old elf got even though – in the notes, he also guaranteed the bottles would be free. I found this out later when folks started bringing me the hand-written notes. What could I do? The letters were signed by Kris Kringle himself! I wasn’t going to call Santa a liar. So for the first time in my life, I gave away my Wizard Water©. But I charged for the bottles. Described that way, most folks anted up. I sent the old fellow a letter this year asking him for a new hat for Bleb, some horehound candy and a bullet-proof frock coat, but I may be in for a disappointment. I won’t mind, though. We can use the coal. Winter is setting in and every morning now my wife has to knock ice off the water pump. That’s not so bad. One year it was so cold the fire froze and we had to wait for the sun to come up for it to thaw out. We kept warm by rubbing an iron rasp against the flames. I had an idea and started whittling off pieces. I was hoping I could mix them with a little Wizard Water© and sell them as genuine “fire water” at twice the usual price. They unfroze, though, before I could stuff them inside any bottles. Real fire water's too dangerous to make. But if it had worked, I could have given the local brand of white lightning some strong competition! I was up in Dahlonega this week. Mr. Nix, who owns the general store, had just gotten in a shipment of men’s boots. Problem was, the boots were all white. Mr. Nix did as I suggested, and he sold every single pair. The tar and chicken feather shortage. Some of the folks who read an earlier post may be wondering just what exactly a "jinglewhapper" is. The answer is: I don't know. Not exactly, anyway. I think it is a musical instrument consisting of a center pole made of painted and varnished wood, to which is attached all manner of percussive equipment. It could, however, also be some kind of torture device; some folks have told me so after I have attempted to play the thing. Jinglewhappers are not unique - I have seen them in a variety of styles, depending upon the player's personal taste in noise. 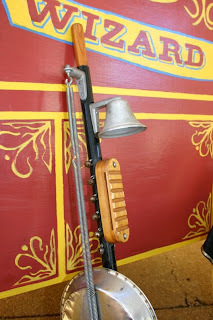 My jinglewhapper (pictured here) has a metal bell (sans interior clapper), a hollow wooden thingamajig, two coiled wires stretched tight against a tin pan, and bells that jingle. It rests on a large rubber ball which one can pound on the ground. You create sound by whapping various parts of this contrivance with a drumstick, or by pounding it on the ground, or both. If you want a jinglewhapper of your own you will have to make it. The fellow who made this one disappeared under mysterious circumstances and I have never found anyone else willing to assemble such a device. Some town authorities have thanked me for not pursuing the matter. The instrument's musicality has never been a real issue. Its primary purpose is to attract an audience, which it does admirably. 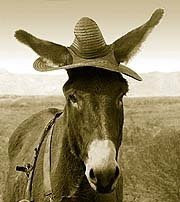 My mule Bleb once served as mayor of a town out West. The human mayors tended to die of gunshot wounds, and when the townsfolk saw him help me with the medicine show (Bleb could laugh on cue), it occurred to several folks that a real jackass might work out better in their highest elected office. We declined at first, but we were caught leaving town and brought back, and Bleb occupied the mayoral seat (from a barn) for six months. We would still be there, but they discovered that Bleb had not been born in the territory and therefore was not a legal resident. Also, they located a trained dog who could shake hands better. The mayoral service paid rather well and I was sorry Bleb was unseated. It should be legal to elect animals to high office, though, when qualified humans are in short supply. Little known facts: Paul Revere and the Sons of Liberty planned the Boston Tea Party over pints of ale in a tavern. As a young lawyer Abe Lincoln owned several taverns, and after he and Stephen A. Douglas debated, they both quenched their thirst in a saloon. Bars and saloons are patriotic. They encourage commerce, freedom of speech, and the pursuit of happiness. That’s why I say: More polling places should be in saloons. Always vote for the man who will pay you the most. Take the money up front, though – any man who makes his living off of promises can’t be trusted. Believe me, I’ve had some experience with this. You should vote as often as you can get away with it. My wife and I drove the wagon over to the Sixth Annual Cowboy Festival & Symposium at the Booth Western Art Museum in Cartersville, GA one wet night this past week. I was mighty glad the wagon top didn’t blow off on our way in to town, the way it did last year. 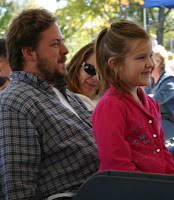 The folks at the festival were right friendly, despite the occasional gunfight. A whole troupe reenacted the gunfight at the O.K. Corral, but nobody got hurt this time. I played some music on the jinglewhapper, and luckily didn’t get hurt, either. I came out of the event lighter in bottles but heavier in trade goods – I got myself a hat, a coat, and four bottles of home-made barbeque sauce. The Missus enjoyed some good Dutch oven peach cobbler, bean stew and biscuits, and attended “Cowboy Church” outdoors on Sunday morning, preached by a genuine rancher (the only sermon she’d ever heard where cow poop figured prominently). Indians were present and dressed better than anybody. “Hopalong Cassidy”(aka Joe Sullivan) showed up late on Sunday afternoon, with a few things to say about my famous Skull of Cleopatra, but that’s another story for another day. Doc and the Mrs. had a good time at this year's Gold Rush Days in Dahlonega, Georgia. Mrs. Doc picked up some bargains in pickled green beans and chow-chow from the farmers' market. Doc had himself four porkchop biscuits. Mrs. Doc had lemonade made by the Boy Scouts. Doc found a picture of an old Indian chief he once knew and soon it will hang someplace in the house where it won't scare small children. The buck dance contestants ranged in age from 8 to 80, or thereabouts, and Sadie Bafile (pictured above left) won by popular acclaim. The hog-callers were numerous and as enthusiastic as the woman in the photo at right. The wheelbarrow race proved once again that sometimes just one wheel is all you need. Phil and David from Georgia Traveller (GPB-TV) stopped by and entered the cross-cut sawing contest but their time (1 minute, 40 seconds) was beaten by a couple fellers who did it in 43 seconds flat. The arm-wrestling contest was intense as usual. Doc had to remind everyone that there is "No spitting, smoke-blowing, or distracting your opponent by yelling things like 'I've got a loaded gun in my other hand!'" Doc wishes to thank the Dahlonega Jaycees for all their hard work putting on this mighty fine festival! Doc will be back next year, if the sheriff will let him inside the town limits. Come enjoy Gold Rush Days in Dahlonega, Georgia October 18 - 19, 2008, where Doc will be emceeing a parade and other events! 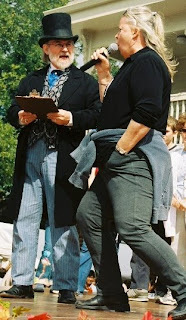 Enter the hog-calling contest (like the woman at left), or the liar's contest if you're good at tall tales! Winners decided by audience applause! Watch young cloggers compete, try your hand at gold panning or cross-cut sawing, or just walk around and enjoy the crafts and food booths. Say "hey!" to Doc - he'll be at the main stage in front of the Visitors' Center! Be sure to get there early, though - parking spaces fill up fast and the later you arrive, the further you have to walk from your buggy! Doc was unable to host the Mountain Music & Medicine Show yesterday due to urgent government business. It seems his presence was requested by the county sheriff regarding official matters. As a conscientious citizen who deeply respects the law and its representatives, Doc could not refuse to attend this meeting of the highest county authorities, including not only the sheriff, but a judge and several legal representatives of the county and state. Luckily the Buzzard Mountain Boys were able to step in and host the show during his absence. 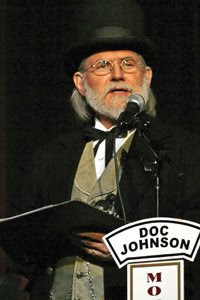 Doc expects to be present at the annual Goldrush Days in Dahlonega (October 18 - 19, 2008). p.s. Concerned citizens may query "Doc" or "Mrs. Doc" at docshows (-at-) gmail.com or docshows (-at-) hotmail.com. "Doc" Henry Johnson sells his wondrous Wizard Water© to the gullible and the easily amused in this recreation of an 1890's traveling medicine show. Long a staple of festivals throughout Georgia, "Doc" also hosts the award-winning Mountain Music and Medicine Show, which can be seen live at the Holly Theater in Dahlonega, Georgia, or heard via Georgia Public Broadcasting. Doc also has a website. Doc Johnson's Wondrous Wizard Water is copyrighted 1981, 2008 by J. Henry Johnson.